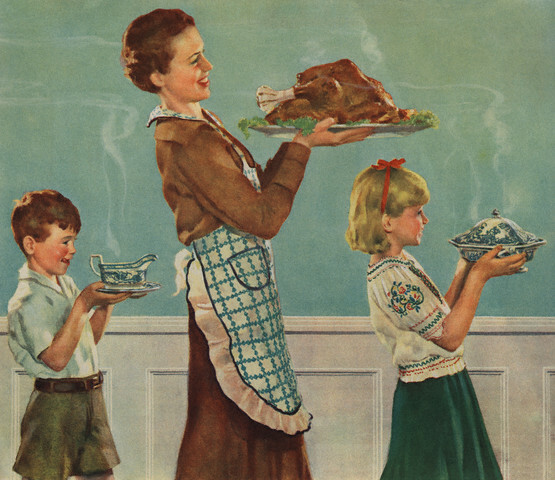 The Article: Inventing Thanksgiving by Brian Awehali in AlterNet. The Text: Every year, as Thanksgiving approaches, I am filled with profound ambivalence. Even as a child, the standard Thanksgiving story always seemed too simple, too wholesome, and too peaceful to be true or truly American. Finally, past the faux-historicism of school textbook-styled Pilgrims and Indians, I was able to delve into the actual construction of the story of Thanksgiving. And, in this way, I learned just how fabricated and utterly bizarre this American “holiday” really is. Contrary to the widely accepted, idyllic account of two cultures sitting down to share a meal in harmony, most 17th-century colonial images relating to Native Americans depict violent confrontation. It was only around 1900, when the western Indian wars had largely subsided due to a shortage of Indians left to kill–and when it was safe for Euroamericans to supplant fear with nostalgia–that the romantic Thanksgiving narrative most Americans today are familiar with took hold. Thanksgiving Day provides an ideal opportunity to consider the formation of national identity and the concept of a civil religion. It’s also a living metaphor of the prevailing American model for immigrant assimilation and the ways in which history can be reinterpreted, and indeed wholly reinvented, to serve competing ethnic, patriotic, religious, and commercial ends. Forasmuch as it is the indispensable Duty of all Men to adore the superintending providence of Almighty God; to acknowledge with Gratitude their Obligation to him for benefits received, and to implore such further Blessings as they stand in Need of: And it having pleased him in his abundant Mercy, not only to continue to us the innumerable Bounties of his common providence; but also to smile upon us in the Prosecution of a just and necessary War, for the Defence and Establishment of our inalienable Rights and Liberties… It is therefore recommended to the legislative or executive Powers of these UNITED STATES, to set apart THURSDAY, the eighteenth Day of December next, for the Solemn Thanksgiving and Praise: That at one Time and with one voice, the good People may express themselves to the Service of their Divine Benefactor. It was not until 1931, when President Herbert Hoover made his proclamation, that any of the presidential declarations of thanksgiving mentioned the Plymouth Pilgrims and the 1621 harvest festival as a precursor to the modern holiday. By this time, yet another willfully amnesiac reinvention of Thanksgiving was under way. Thanksgiving eased the social dislocations of the industrial and commercial revolutions… The growth of commerce, industry, and urban life created a radical break between past and present, a gap that could be bridged by threshold reunions at the family manse. Nostalgia at Thanksgiving was a yearning for a simpler, more virtuous, more public-spirited and wholesome past, located in the countryside, not the city. In gaining wealth, the family and nation, it was believed, had lost its sense of spiritual mission. Perhaps celebrating one special day might help restore the religious morality of an earlier generation. In the aftermath of World War I, at a time when many Americans were concerned both with preserving and promoting (in Pleck’s words) a “close-knit, religiously inspired [Protestant] community,” and, not coincidentally, with the “Americanization” of Northern and Eastern European immigrants, Thanksgiving Day provided a compelling occasion for emphasizing civil religion, the quasi-religious belief in national institutions, purposes, and destiny. Furthermore, the model of the Pilgrim as the archetypal “good” immigrant, peacefully coexisting in prosperity with other ethnic communities, proved all but irresistible. The ideal of the “melting pot” in the United States — often less about relishing a diverse mix of ethnic elements than about reducing ethnic culture to an assimilated national identity — also exerted a powerful influence. By the time of Hoover’s 1931 proclamation, the codification of Thanksgiving as the fundamental American holiday was essentially complete. Which is not to say that Americans were done tinkering. One noteworthy and almost quintessentially American reformulation was ushered in by the Macy’s Thanksgiving Parade. This commercial pageant began in 1924 as the Macy’s Christmas Parade because, as Elizabeth Pleck observes, “The department store wanted to stage a parade as a prelude to the Christmas shopping season.” Pleck also notes that even in the 1920s, the parade did not exist in the shadow of the family feast or the church service, but in very real competition with another Thanksgiving tradition: the afternoon football game. Football was clearly the more significant of the two forms of out-of-home entertainment, as changes in the timing of Macy’s parade in the 1920s indicate. Initially, Macy’s parade offended patriotic groups, who decried a spectacle on “a national and essentially religious holiday.” Macy’s hired a public relations man, who decided the critics could be placated if the parade in the morning was postponed until at least after church services had ended. The parade, pushed to the afternoon, began at the same time as the kickoff for most football games. Customers and football fans complained. By the late 1920s, Macy’s had returned to an early morning parade, presumably so as not to compete with afternoon football games. The parade featured different groups of immigrants demonstrating their American cultural fluency with floats that echoed and reinforced the core Thanksgiving origin myth. At about the same time, schoolchildren were being exposed to similar ideas about celebration, national history, customs, and cultural symbols, all of which came together to form the narrative that persists more or less intact to this day. Perhaps, given the patent falsehood of the Story of Thanksgiving, one of the better questions to ask as the holiday approaches is what, in fact, it really stands for. As a Cherokee, I have never felt much like celebrating an event that essentially commemorates one of several stages in the genocide of Native Americans by European settlers, a process which continues to this day in the form of environmental racism, structural poverty, and lack of educational resources. There were times, to be sure, when I appreciated sitting with my family and devouring an embarrassment of culinary riches. But those I hold separate from the holiday itself. For me, this now agreed upon Thanksgiving symbolizes first and foremost the alarmingly subjective nature of history, which, as Howard Zinn reminds us, is almost always written by the winners. It symbolizes the triumph of football over religion, and of American commercialism over virtually everything standing in its wasteful path. And perhaps most importantly, it symbolizes the lies and half-truths on which a profoundly diverse country must depend in order to prop up the specious concept of a broadly shared civil religion or national identity. Thanksgiving, then, symbolizes that there is still great work to be done before a nation that readily prides itself in its goodness, honesty, and wholesome relationship with Divine Grace will actually resemble the stories it tells itself.